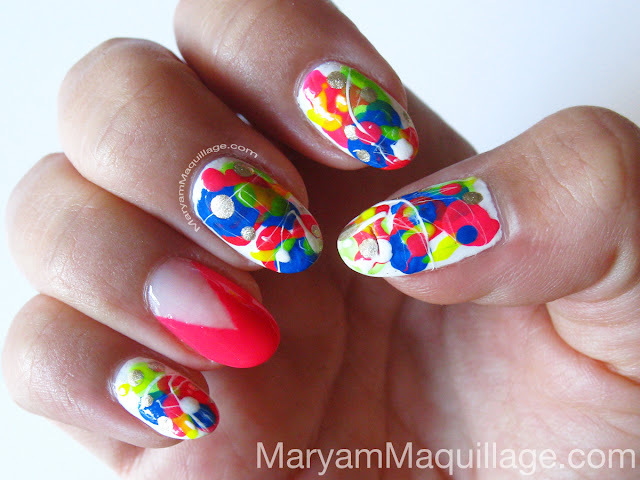 Paint splatter nails have been popping up quite frequently in the beauty blogosphere and fashion venues. I generally tend to stay away from trends, but I couldn't resist the art aspect of this one -- I just had to try it. My spin on the paint splatter nails was inspired by neon street graffiti (image from Google) and Jackson Pollock textured "drip painting" artworks (fragment below; my personal photo taken at the Philadelphia Museum of Art). Mont Bleu* glass nail file -- to shape my tips. I've come to the conclusion that glass nail files are the best nail files in the world! 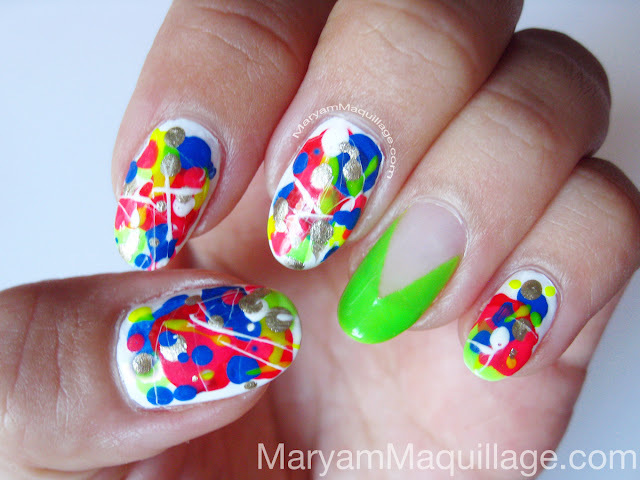 PAINT SPLATTER NAILS HOW-TO: Best part of this nail art is that you can be MESSY... and the messier, the better!!! Paint one coat of white polish over your clear base coat. Using larger dotting tools, stamp a few base dots using blue and neon nail polishes. Blow some air on the dots either through a straw or using an airbrush (see below for your chance to win one). This technique should transform the dots into puddles and/or splatters. Allow a few minutes to dry. Take a smaller dotting tool with less nail polish and stamp some accent dots using gold and white nail polishes. Utilize a thicker old white nail polish to create stringy paint drips / strokes. Pick up the brush allowing the polish to slide off back into the bottle. Run your nails directly under the brush through the remaining thin "fibers" of the polish to create paint drips. You can clean off the fibers off your fingers with a q-tip. Allow the layers to dry completely and finish the manicure with a clear top coat. Take a small piece of tape, fold it in half and tape the edges. Cut a narrow diagonal through the crease to cut out an acute triangle shape. Tape the triangle to the root of your nail, with the point touching the root of the tip. Use any neon polish to paint directly over the tape stencil and wait for the polish to dry completely before peeling off the tape. Finish with a top coat. Looking for truly NEON nail polish? Born Pretty Store* has a huge array of Fluorescent Neon Nail Polish colors that also glow in UV / LED Light = Perfect for a rave!! 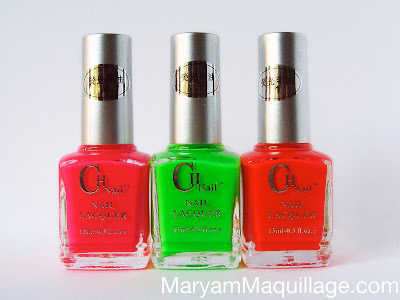 DESCRIPTION & VERDICT: These nail polishes are not just truly fluorescent and neon, they also glow under UV / LED lights. I haven't personally tested this out, but if you follow the links above, you'll see photo examples of each. The neon pink and red need only 1-2 coats to be completely opaque, whereas the neon green is much more sheer. In the first photo, I'm wearing 4 coats on my accent nail and if you look closely, you can still see where the tip of my nail starts. This is a bit of a drawback, but not a complete deal breaker, because the polish is buildable and dries very quickly. 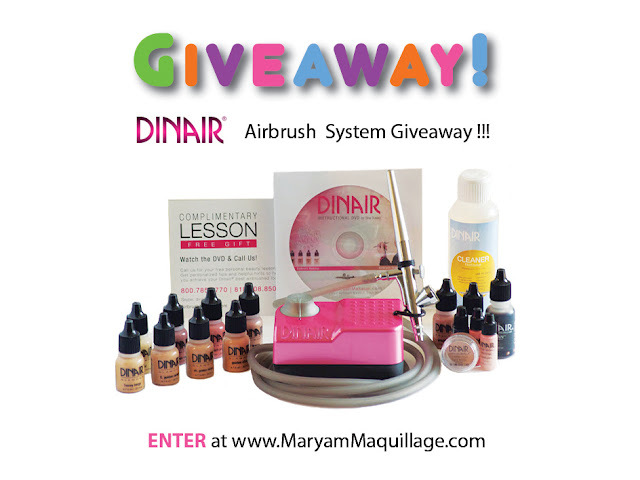 P. S. LESS THAN 12 HOURS LEFT TO ENTER MY DINAIR GIVEWAY!!! *The product/s in this post were sent by said company for my use and consideration. I was not paid for this review and the information stated is solely my opinion. 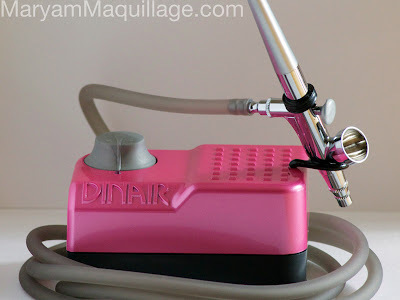 The traditional way of doing it is very messy, I agree, that's why I used an airbrush to avoid the mess!! Those are pretty cool! I wish you didn't do the accent nail though. Throws everything off. WOW!! You never fail to impress me your nails look amazing the effect is just awesome. Exotic exciting and spectacular ! Sheer Maquillage Magic ! 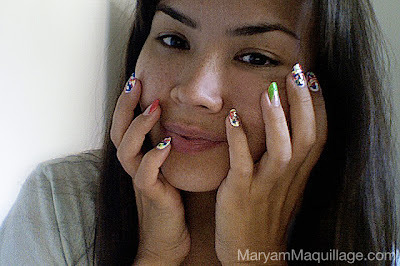 I love your nails!!!!! So beautiful and unique!! Would you like to follow each other? love it!! Reminds me of the show art attack!! OHHH i love this its so artistic! OH my gosh! Best summer nails!!! Love the nails! So artistic! Gorgeous! My goodness, I REALLY need to grow my naisl out. Everytime I see your designs, FIERCE, FIERCE, FIERCE! wow......your nails are super cool!!! 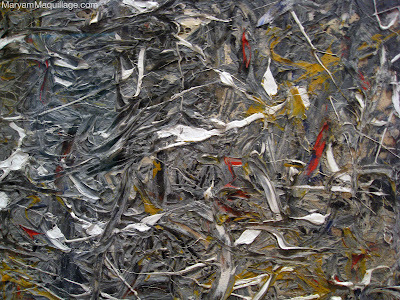 love the Pollock effect!!!! Super trendy! Great job ;o). Have a nice day. XOxo V.V. Thank you so much for comments and compliments everyone!!! I like the bright colors you used here. Would totally rock this for Summer. Wow, this is one of my favourite nail posts of yours ever!!! This looks way too awesome, no wonder you got so many comments on them!